STAR TRACE Retort and Vacuum distillation ovens ranging from 0.5 cubic feet to 40 cubic feet material capacity. Both fuel fired and electric models are available. Mercury condensing and handling systems are included with all retort systems. 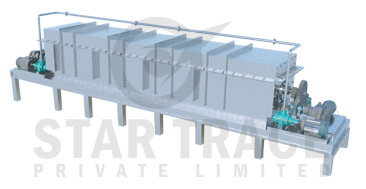 Star Trace Retort and Vacuum distillation ovens ranging from 0.5 cubic feet to 40 cubic feet material capacity. Both fuel fired and electric models are available. Auger flights convey the parts smoothly and quietly through the furnace. Rotation of the retort has a wide range of speed adjustment to provide complete flexibility of time processing cycles.The edges of the internal auger flights are integral with the inside wall of the retort to prevent parts from getting stuck. Stainless Steel retort have superior mechanical strength characteristics compared to work Mild Steel designs. Furnace lines are pre-engineered in standard sizes with rated capacities from 225 KG to 450 KG.